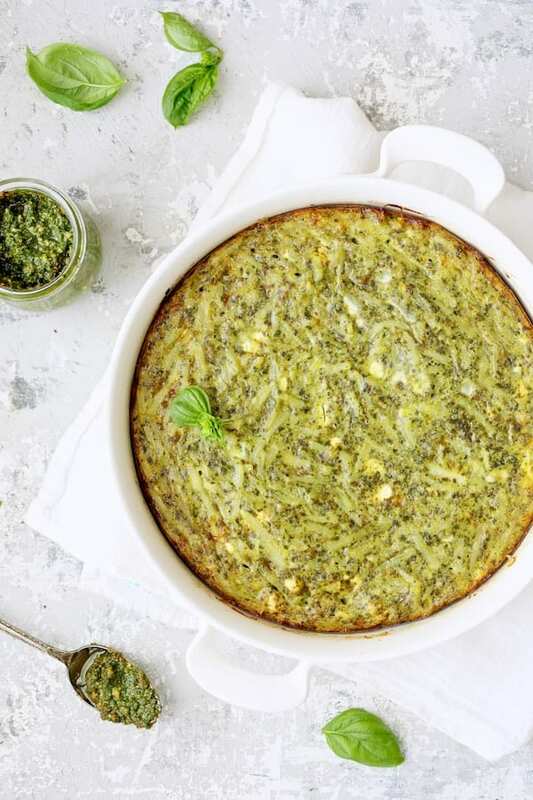 Easy Hash Brown Frittata with Pesto and Goat Cheese is impressive and comes together quickly for the perfect summer breakfast, brunch or light dinner! I’m having a really hard time staying ahead of my basil “crop” so it’s highly possible you will see more pesto recipes coming up! Several weeks ago before heading up to Wisconsin, I grabbed a bag of hash browns to make a breakfast casserole to take with us. We’re the perfect guests because we bring a cooler full of food with us! 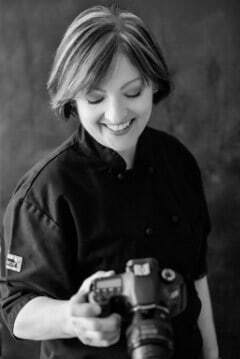 Many of the meals I make to share with you here at From A Chef’s Kitchen get frozen. It’s just my husband and me and we just can’t eat everything I make. So, we eat what we can, I give some away to a neighbor and then freeze as much as possible. It works out perfectly! Our families don’t have to worry about feeding us and the food doesn’t go to waste. We purchased a huge cooler to transport the food and the food stays completely frozen for a couple of days if it’s not opened. Check it out in the recommended products section. It’s been worth every penny and it’s perfect if you need to transport a lot of food safely. Yup. A lot of work. If I were making actual hash browns, I’d use Russet potatoes and make them from scratch. However, for a breakfast casserole or frittata such as this, refrigerated hash browns work beautifully and all the water has already been extracted. 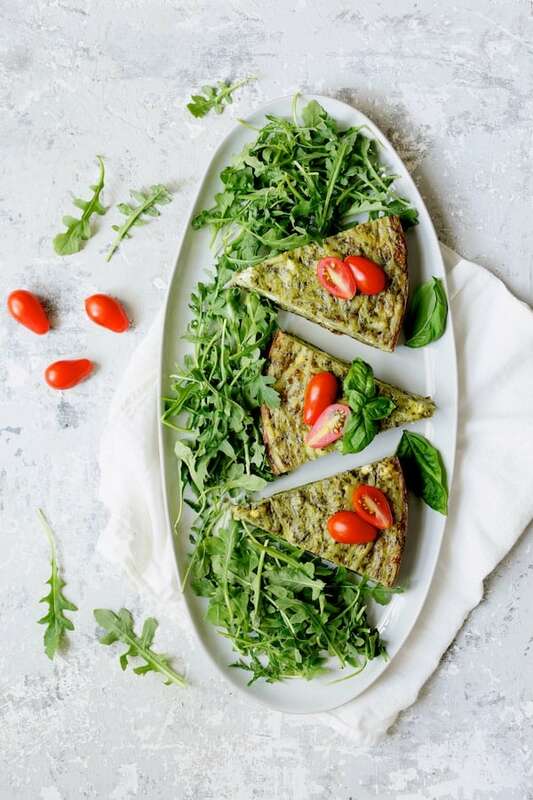 This frittata is ridiculously easy! Making the pesto will take you the longest. However, if you have pesto in the freezer from last summer you’d love to use, this is the perfect way to use it. Generally, frittatas get started in an oven-safe skillet on the stovetop, then placed in the oven to finish cooking. This frittata simply bakes in the oven. Combine ready-to-use refrigerated hash browns with pesto and goat cheese. Add a little salt and pepper if needed. How crazy simple is that? 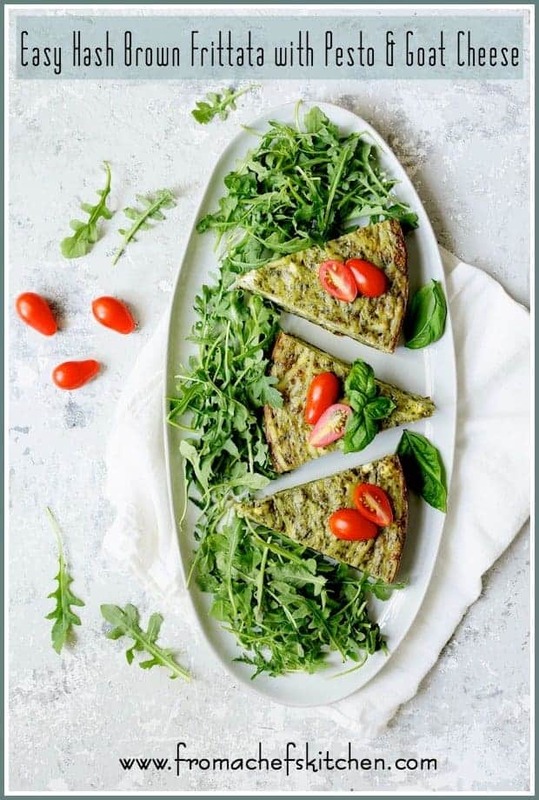 Serve with a green salad or tomato salad and you’ve got a lovely, elegant breakfast or brunch! 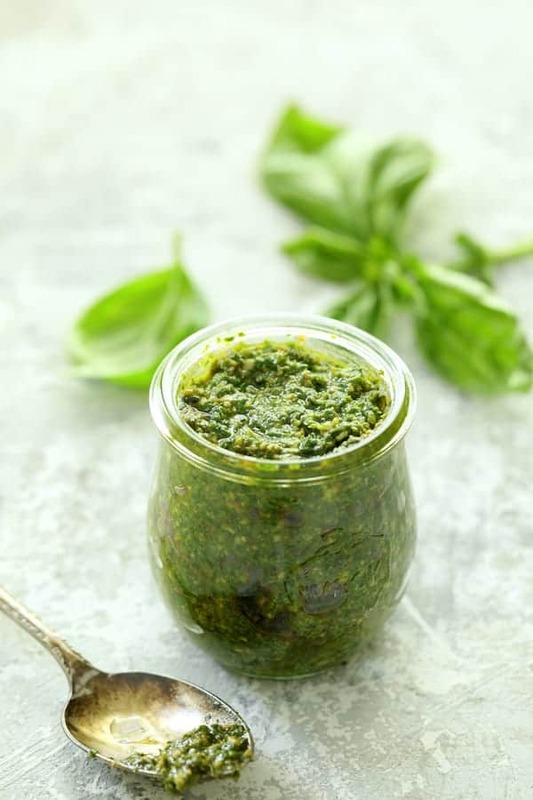 Be sure to check out my other recipes with delicious ways to use pesto! 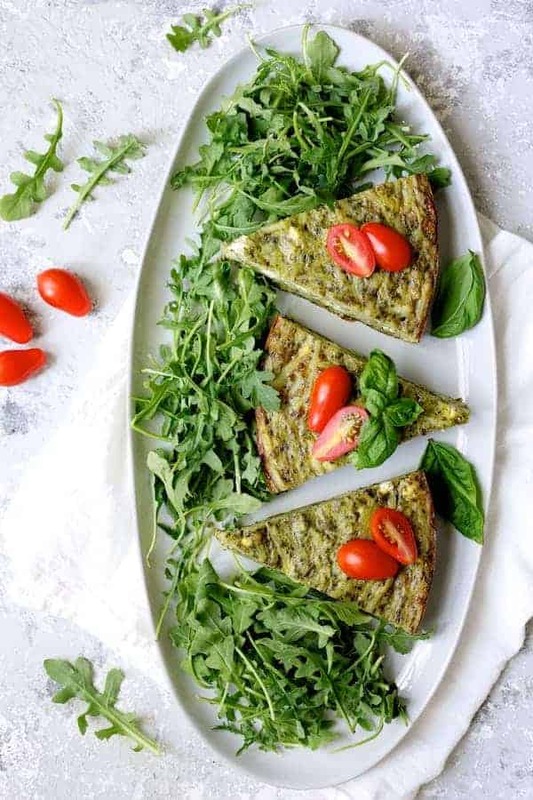 Easy Hash Brown Frittata with Pesto and Goat Cheese is impressive and comes together quickly for the perfect summer breakfast or brunch! Preheat oven to 375 degrees. Spray a deep, round 10 to 11-inch baking dish with cooking spray or brush with olive oil. Combine hash browns, goat cheese and pesto in a bowl. Season with salt and black pepper. Pour into prepared baking dish. Whisk together eggs and half-and-half. Pour over potato-egg mixture. Bake for 45 to 50 minutes or until eggs are set. Let stand 5 minutes then cut into wedges. Previous Post: « Taste Matters – Tomato Time! Thanks, Aleta! 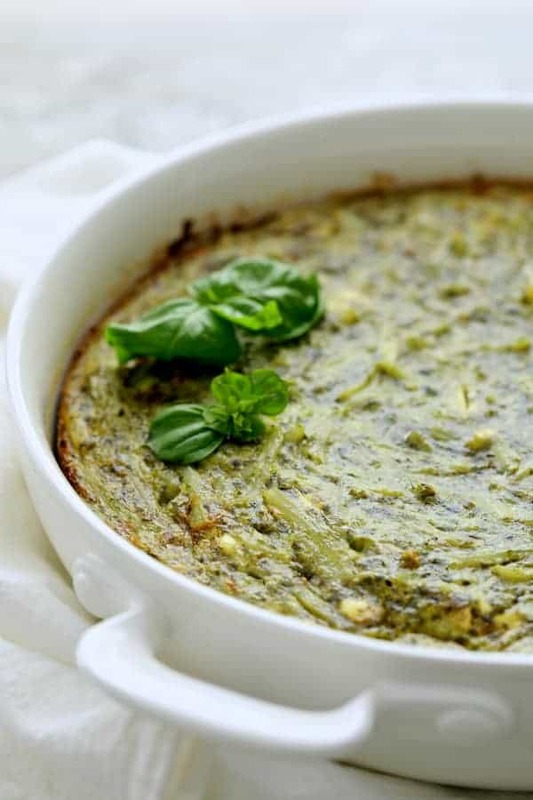 Pesto and potatoes are one of my favorite combinations! Interesting! I’ve never purchased frozen hash browns, but now I see the benefit. 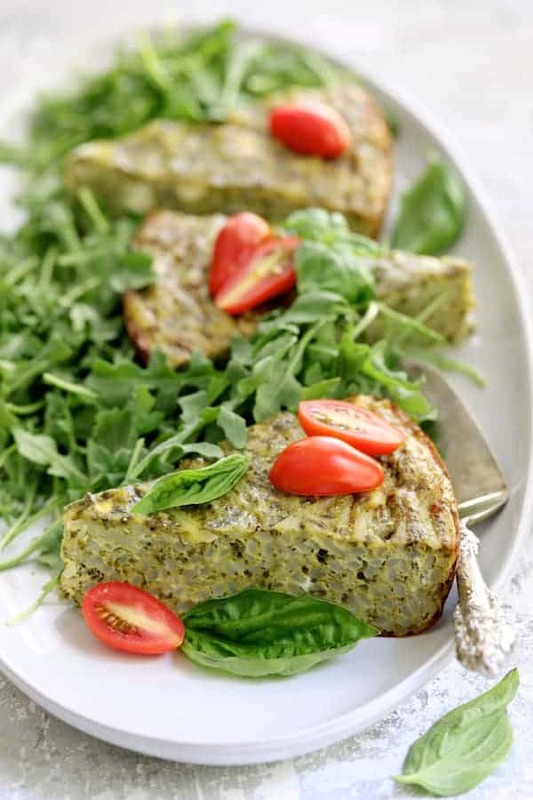 The ingredients in this frittata are lovely – especially the addition of pesto. And I just made another huge batch this morning! Hi, Mimi, I use the “refrigerated” hash browns. I’ve purchased the frozen kind in the past and because they’ve been frozen, there is still a fair amount of water in them. Thanks so much! Okay, you just made me super hungry Carol. I love that you include directions to extract water from the potatoes…this is very helpful! Thanks so much, Sandi! Yes, if you want to go that route with raw potatoes you certainly can. To make life a little easier, I suggest the refrigerated hash browns. All the moisture has been extracted already. Thanks again!